Faded annuals, and the foliage and spent blossoms of some perennials and shrubs have been pulled out and are ready to be carted away. Here in northwestern Connecticut, the fall foliage show is nearing its peak, and in some places, the leaves have begun to fall. They rustle at our feet as we go about our rounds. This is Nature’s way of telling us it’s time to clean the garden. 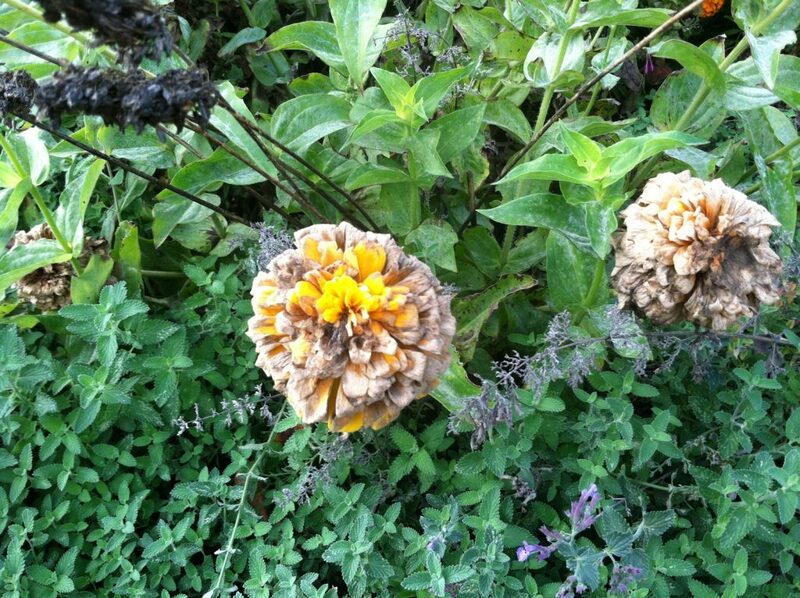 The spent flowers of a zinnia are beginning to develop mold. They’ll be cut and discarded, but for the time being, there is a certain beauty in decay. For starters, we remove most annuals. In general, these plants are easy to spot because after the first hard frost, many of them, including impatiens, begonias, and coleus, have withered and turned brown. 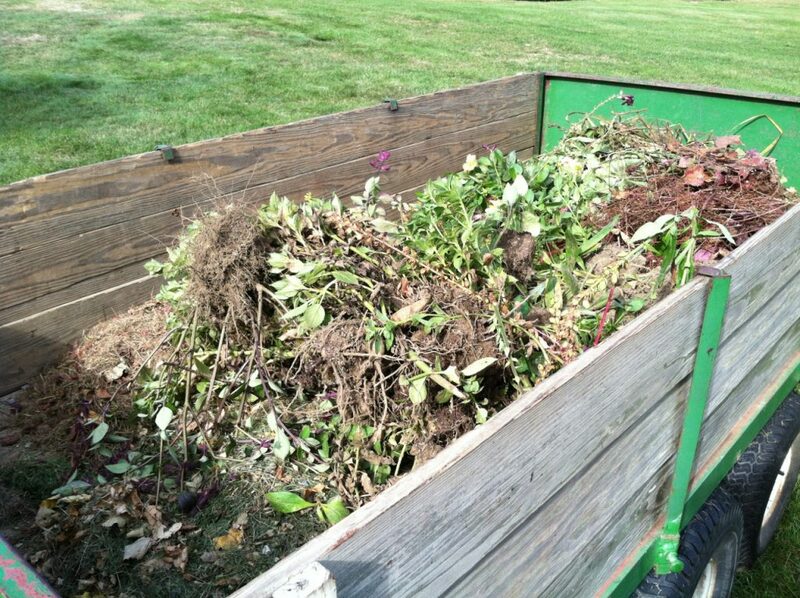 If the spent foliage and blossoms on these plants are free of mold and disease, we put them in the compost pile. If we see traces of powdery mildew (zinnias are often afflicted), downy mildew or other diseases, the plants are put into trash that’s hauled off the property. Keep in mind that any mold or disease that’s allowed to stay in the garden will overwinter and reinfect new growth in spring. In the perennial garden, our methods vary. 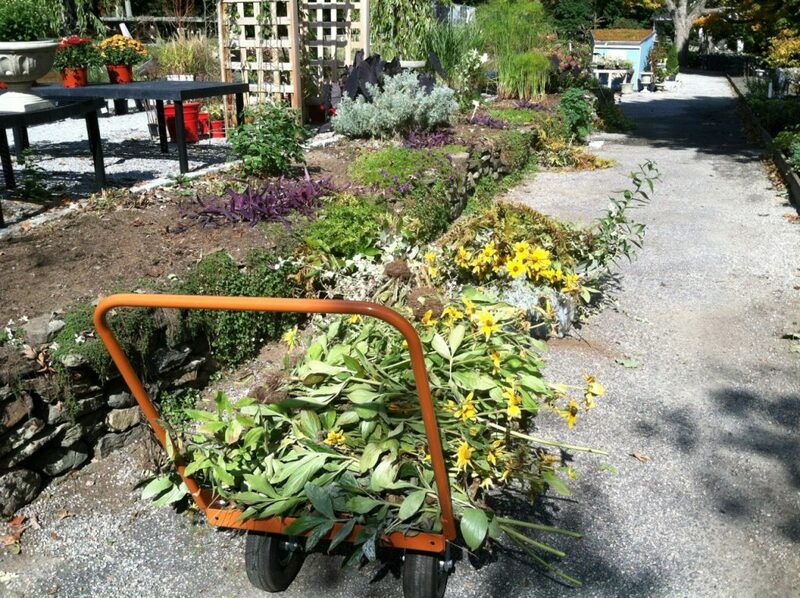 In the shady beds near the store, our gardeners clean and clear away dead and dying foliage. They cut back ferns, hostas, astilbes, and ligularias. Why? One year, when they let the decaying leaves lie, they discovered that the cushy, warm environment attracted critters who dug around and sometimes nested in the leaf mulch. That would have been all right except the critters didn’t stop at the mulch. They burrowed into the roots of the plants, inadvertently killing a few, and those had to be replaced the following spring. 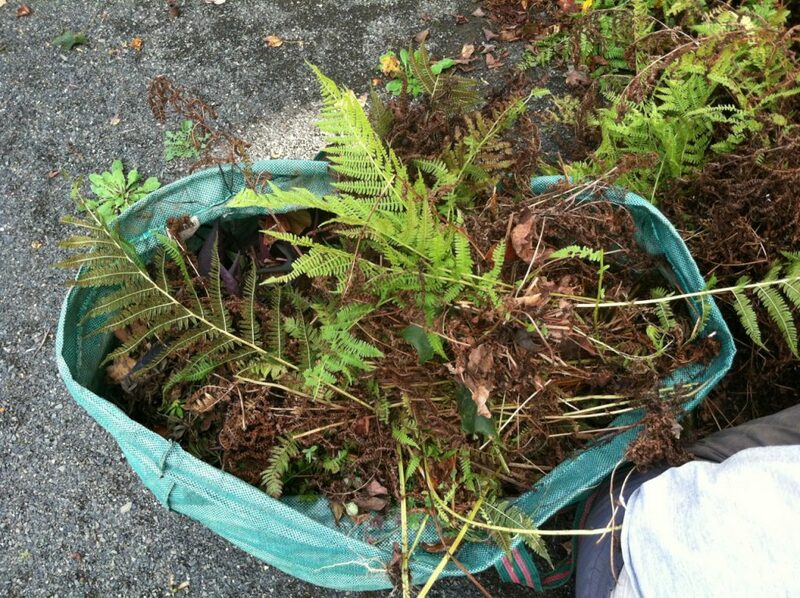 Browning fern foliage is yanked out and hauled away. In areas where critters don’t pose much of a problem, Pierson and many others believe that the decaying leaves of most deciduous trees are beneficial to the garden. For starters, they form a natural leaf mulch that provides insulation for perennials and shrubs. Oak leaves, which are waxy and don’t easily break down, are particularly good for insulation. Mounding them around perennials and shrubs protects the plants from seasonal temperature swings. Pine needles are another fine insulator, and they’re especially good for acid-loving plants including rhododendrons and azaleas. Leaves that break down more readily such as maple, ash and birch leaves add organic nutrients to the soil, and help improve soil structure. 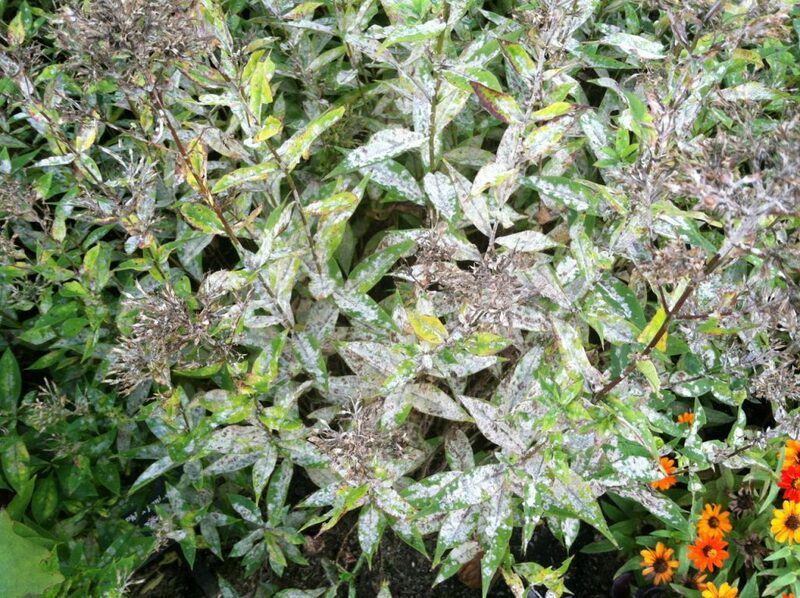 The foliage of Phlox ‘Robert Poore’ is covered in powdery mildew. The plants need to be cut at the base and removed or the mold will return in spring to re-infect the plants. It won’t inhibit the blossoms, but it’s not much to look at. As with annuals and vegetable plants, it’s important to note that any perennials or shrubs that exhibit mold or disease should be cut back, and the spent foliage and blossoms should be carted away to the trash (not the compost pile). Plants like Perovskia (Russian Sage) should not be cut to the ground, Pierson says. “The most important thing to remove is the foliage – not the crown or stems – so I would say remove leaf litter and prune stems as you would for that variety, in general 3-4” above soil level.” Some of the perennials and shrubs most commonly affected by powdery mildew include peonies, monarda (bee balm), phlox, and roses. As with vegetable plants and annuals, if you leave afflicted plants in the garden, the mold and disease will overwinter and reassert itself in spring. The mold won’t interfere with blossom production, but it will detract from the beauty of the foliage. 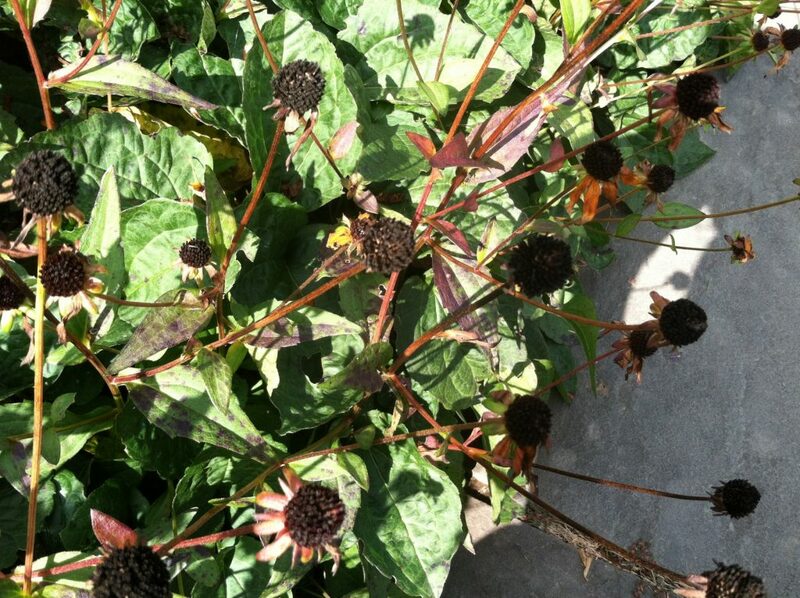 We like to leave the seed heads of Echinaceas (Coneflowers) in the garden. Birds feed at them, and they also add winter interest when dusted in snow. As you cut down bee balms, phlox and peonies, keep in mind that there are other perennials and shrubs you’ll want to keep. While ornamental grasses can be cut back in fall (leaving 6” of growth to protect the crowns), the argument for leaving them until spring is that they look quite lovely dusted in snow. The seed heads of Echinacea and the berries of Ilex verticillata (winterberry) feed the birds as winter sets in. The pods of Asclepias, the flower clusters of Sedum ‘Autumn Joy’ and Eupatorium, and the seed heads of Echinaceas (Coneflowers) all provide winter interest. 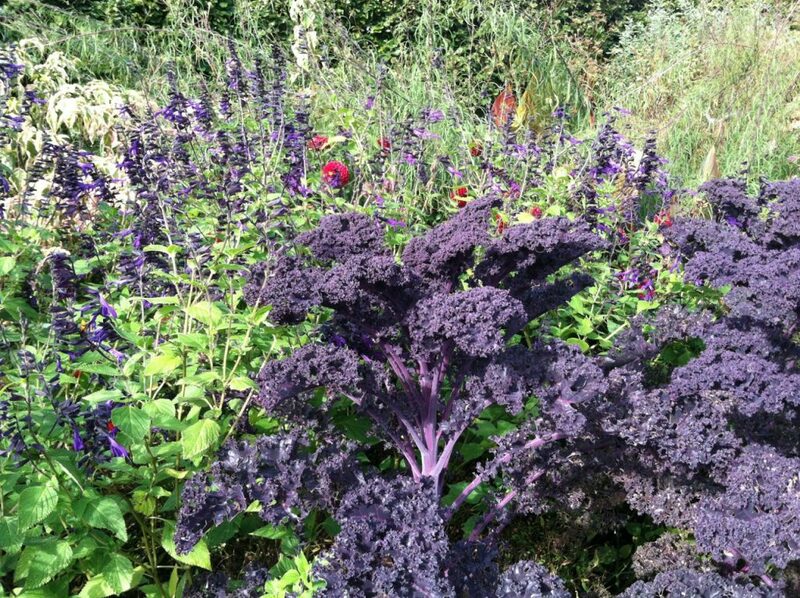 Purple kale won’t be taken out of the garden until a deep freeze. For now, the intense color adds beauty to the autumn landscape. So clean as much or as little as you choose depending on the types of plants you have in your garden. But whatever you decide, it’s time to grab your rake and pruners, and spend a few days in the glorious autumn weather putting your garden to bed. 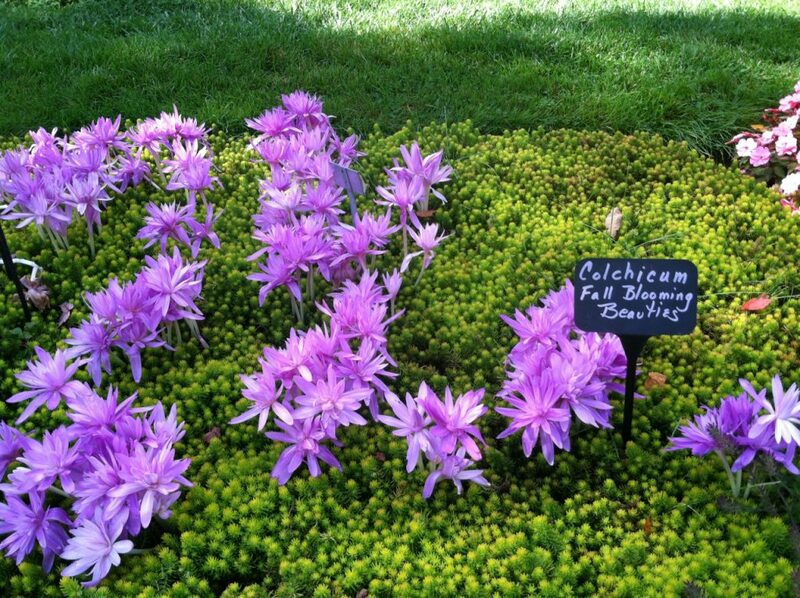 In one of the display gardens, the bright lavender blossoms of the autumn-blooming Colchicum have popped up amid a sea of lime-colored Sedum ‘Angelina.’ We won’t be cutting these!